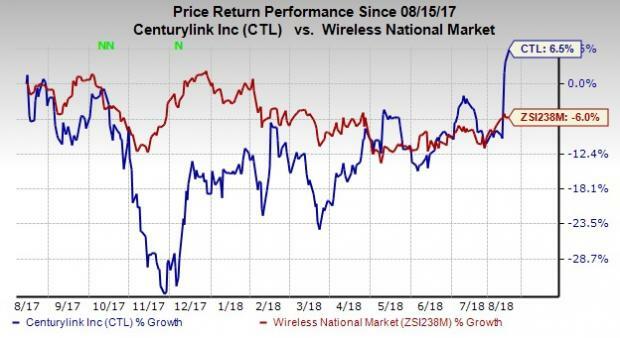 Shares of communications services provider, CenturyLink, Inc. CTL scaled a new 52-week high of $22.04 in yesterday’s trading session, before closing a tad lower at $21.88. In the past year, the stock has gained 6.5% against the industry’s decline of 6%. CenturyLink reported promising second-quarter 2018 results with year-over-year increase in revenues and earnings. It remains focused on fostering improved operational efficiencies through network simplification and rationalization. This should help the company improve its end-to-end provisioning time and drive standardization. CenturyLink has been trying to establish itself as a global leader in cloud infrastructure and hosted IT solutions arena designed for enterprise customers. Its strong network capabilities, integrated hosting and network solutions are likely to promote growth in the cloud business. Notably, the company sees its managed and cloud services as a key differentiator from other players in the market, which is likely to boost its top line. The company’s existing network with millions of customer circuit, a global fiber footprint and an extraordinary IP backbone deliver connections to the world's most important cloud, data center and software-as-a-service providers. The expansion of new services like SD-WAN and embedded security enable it to create competitive advantages in Enterprise networking with the scale and scope that few others can match. CenturyLink’s global network assets, robust product portfolio and willingness to invest for meeting customers’ needs, enable it to evolve. In addition to the integration efforts associated with the acquisition of Level 3, it is focused on transforming to more efficient operating models beyond the capture of synergies. It is working to create a more digital experience across customer base from Consumer customers to largest Business customers. CenturyLink announced that it will provide private network connectivity to the IBM Cloud through CenturyLink Cloud Connect solutions. With this, customers can innovate more effectively by establishing low-latency connections on a global basis across private networks. It also announced that it will offer dedicated and private access to Oracle Cloud through Oracle Cloud Infrastructure FastConnect. Notably, CenturyLink Cloud Connect Solutions, together with Oracle's FastConnect service, will allow customers to enjoy the performance and reliability of a direct, secure connection. For full-year 2018, CenturyLink raised its adjusted EBITDA, free cash flow and free cash flow after dividends guidance on favorable growth dynamics. Adjusted EBITDA is anticipated in the range of $9.00-$9.15 billion, up from the previous view of $8.75-$8.95 billion. Free cash flow is expected in the range of $3.60-$3.80 billion, up from $3.15-$3.35 billion expected earlier. Free cash flow after dividends is projected between $1.30 billion and $1.50 billion, up from the previous range of $0.85-$1.05 billion. With continued growth impetus and core focus, the Zacks Rank #3 (Hold) stock is anticipated to hit new 52-week milestones in the second half of 2018. Better-ranked stocks in the industry include AT&T Inc. T, United States Cellular Corporation USM and Aquantia Corp. AQ. While AT&T and United States Cellular sport a Zacks Rank #1 (Strong Buy), Aquantia carries a Zacks Rank #2 (Buy). You can see the complete list of today’s Zacks #1 Rank stocks here. AT&T has a long-term earnings growth expectation of 3.4%. It surpassed earnings estimates twice in the trailing four quarters with an average positive surprise of 5.9%. Aquantia surpassed earnings estimates once in the trailing four quarters with an average positive surprise of 50%.